When you are on your next scuba diving trip to Grand Cayman make a point to get to Andes Wall. It is certainly one of my favorite sites on the island and is accessible from the West Side dive boat operators or out of Rum Point. Andes Wall Grand Cayman is a great wall dive and is a premium spot for underwater photography. Andes Wall Grand Cayman is located just past Rum Point on the North Wall. Typical conditions are 100+ feet of visibility and has a sheer drop along the wall of several thousand feet. 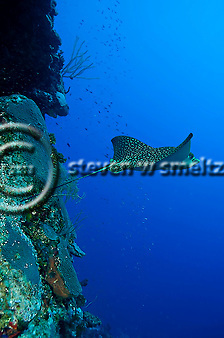 On this dive you will see Spotted Eagle Rays on almost every dive. 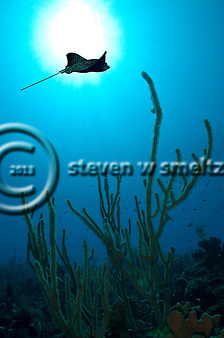 There are also other pelagics that can be found here from the elusive Tiger Shark to White Tips, Hammerheads and more. I went with Red Sail Sports on my last dive at Andes Wall and the day was absolutely perfect for underwater photography. It was one of those extremely rare days when the north wall was absolutely flat. The visibility was over 150, no current, very little particulates in the water and there were only 8 divers on the boat. This must be paradise. Andes Wall is just about 10 to 15 minutes past Rum Point on the North Side and one of my two favorite dive sites on the North Wall. You can dive Andes Wall Grand Cayman as a shallow top of the wall or as a deep wall dive. I would highly recommend the wall dive. When we descended to the mooring the first thing I noticed on this dive was a Spotted Eagle Ray in the distance and a Great Barracuda cruising by. This was one of seven that I saw on this dive. After meeting at the mooring pin, we head to the wall notch, the visibility is absolutely phenomenal. We then made our way through the “notch” to the wall and immediately on my left was another Spotted Eagle Ray. This is going to be a great dive. As we move past the 90 foot level out to the wall I notice a number of Blackcap Basslets swimming upside down in a small indentation in the wall. There are a great variety of fish usually on this dive. Today we see Schoolmasters, numerous types of basslets, Princess Parrotfish, Bermuda Chub, Blue Chromis, Trumpetfish, Gray Angelfish, Spiny Lobsters, Spotted Eagle Rays and much, much more. The soft corals are amazing on this part of the island and they are especially plentiful around the mooring ball on this dive. You will find several great places to get photos of sea fans, or sea rods, sea whips and of course many colorful stony corals as well. Then the shot of the trip. I was setting up to take a shot of a Giant Slit-Pore Sea Rod and looking up towards the sun to frame the soft coral I noticed one of the Spotted Eagle Rays that had been following us throughout the dive and repositioned slightly and the rest…well I will leave it up to the photo to speak for itself. Needless to say I think I found an image that was definitely worth waiting for…. Andes Wall Grand Cayman is magic and as a scuba diver this is a highly recommended dive if you get the chance the next time you come to Grand Cayman and if you are an underwater photographer, perhaps you can make a little magic of your own.